Sustainability has become one of today’s most overused words. We find it in corporate policies, in restaurants, in our favorite coffee spots… need I go on? Even go-to sustainability blog TreeHugger asks “Is ‘Sustainable’ Over?” We argue that, when it comes to sustainable buildings, we’ve only just scratched the surface. In 2000, the U.S. Green Building Council (USGBC) unveiled the Leadership in Energy and Environmental Design (LEED) certification system. Since its inception, LEED standards in sustainability have been an integral thread woven through each LPA project. This year, we reached a milestone in sustainability with the design of 100 LEED projects. From green schools to workplaces, libraries and community centers to recreation facilities, these spaces reach San Diego's middle schoolers, Orange County's amateur oceanographers, the Bay Area's college students and more. Cal Poly Pomona’s reimagined recreation center just celebrated the rising of the last beam in the ceremonial “Topping Out” ceremony. 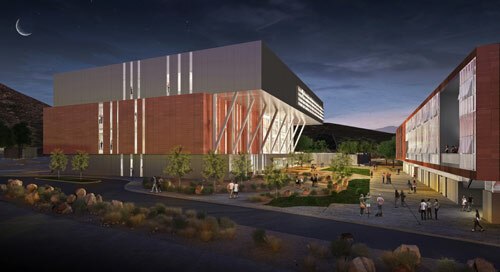 Set to open in late 2014, the Bronco Recreation and Intramural Complex (BRIC) will not only provide space for physical activity—it will promote physical, mental and social health. Using state-of-the-art technology, the center will feature a three-court gym, 16,000 square feet of space for aerobics, martial arts and dance, as well as a climbing rock wall and swimming pool. While it sounds like a nice gym with great amenities, its LEED Gold design makes it so much more. The BRIC will feature sustainable elements like high functioning storm water management systems, “cool roof” systems and maximized access to daylighting. Most impressively, this project is one funded by Broncos for Broncos. 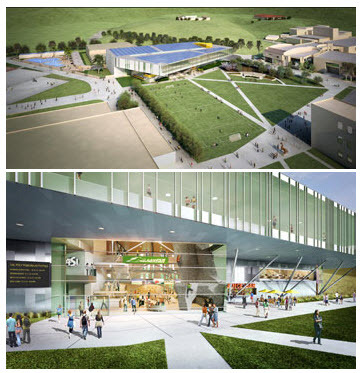 The space will reflect Cal Poly Pomona’s highest priorities in physical fitness, sustainable design and campus culture. Through the BRIC, LPA assists Broncos in communicating their passion for well-being and environmental design. Another facility in construction is ExplorOcean Museum in Newport Beach, Calif. This will be a one-of-a-kind experience for amateur oceanographers and has the potential to become a primary destination for all those living in and visiting the Southern California area. 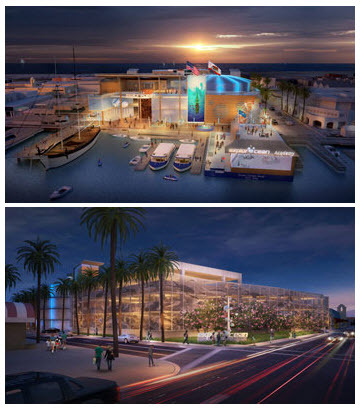 The three-level, 35,000-square-foot facility will feature exhibits and displays to educate kids and adults about our oceans, as well as interactive, four dimensional theaters and simulators. Complete with an ocean-inspired restaurant, café, gift shop, visitors of ExplorOcean will learn in exciting new ways. Plus, the fun continues outside of the waterfront location, with a large event deck, floating Ferris wheel and multiple play and exhibit spaces. The facility’s foundation is in sustainability and is designed to a LEED Platinum rating. Its sustainable message will be evident to patrons with highly efficient elements like a 12,000-foot PV array, which will provide approximately 15% of the energy use. And because the project was designed with an integrated approach, 25% of materials used in construction have been locally sourced and 20% of all construction material is made up of recycled content. With examples such as these, we have to ask—how many more elementary schools, local colleges and corporate facilities would benefit from having sustainable design? Beyond that how many more 3rd grade students, budding young adults and corporate employees would benefit from spaces that feature open, flexible layouts, natural daylighting and healthier indoor environments? You see, sustainable design is not just good architectural practice. It means we’re creating places and spaces that benefit the people that use them. That’s something can never be old or over—it’s what gives our firm purpose.